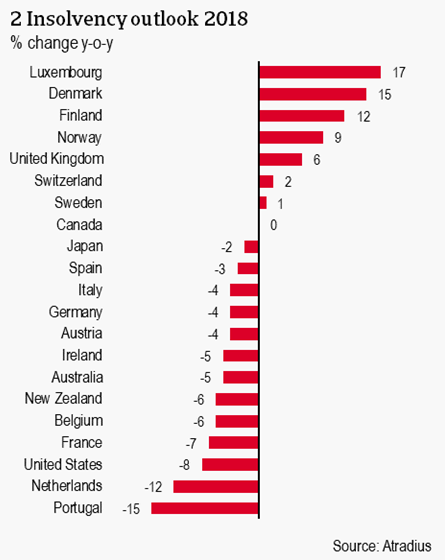 The global upswing is driving another projected 4% decline in insolvencies across advanced markets. Broad-based economic growth and still-low interest rates are driving the improvements. Risks to the global outlook are increasing, especially stemming from trade policy uncertainty and monetary tightening. 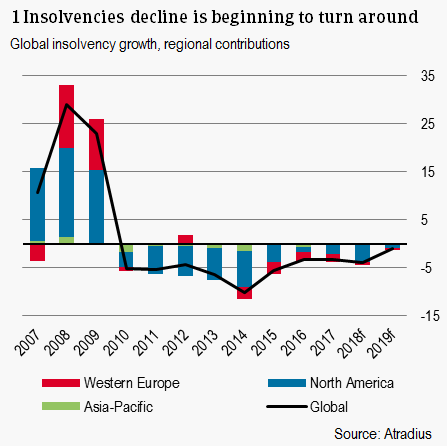 This will likely put the brakes on the downward trend in global insolvencies with only -1% forecast for 2019. The global economy remains healthy with a broad-based upswing bringing GDP growth to 3.1% this year, the fastest expansion since 2011. Insolvencies across advanced markets are expected to decrease 4.6% overall this year, a projected 0.5 percentage points better than last quarter’s forecast. The more optimistic outlook is driven by the strong performance of the US economy in H1. But global growth is losing momentum as downside risks, especially from trade policy uncertainty, increase, warranting a more cautious outlook for 2019. GDP growth is forecast to ease to 2.9% in 2019, bringing along with it a smaller drop in insolvencies of only 1.2%. On top of slowing GDP growth and higher uncertainty surrounding international trade policy, companies around the world are facing higher financing costs and changing consumer preferences. As such, insolvency developments are expected to stabilise in 2019 with the level of global business failures falling in line with 2007 levels. Economic strength in the eurozone has been one of the key drivers of the broad-based global upswing since 2017. The outlook for 2018 remains strong however we expect momentum to begin to ease in 2019. The outlook is characterised by robust GDP growth, declining unemployment, and strong business and consumer confidence, key positive drivers for the insolvency rate. Following a decline of 6.7% in 2017, eurozone insolvencies are projected to fall 5% this year and only 1.8% in 2019. The threat of protectionism, a hard Brexit, and political uncertainty in Italy are downside risks to the positive outlook. GDP growth in the Netherlands is expected to remain robust in 2018. Private consumption remains strong as the labour market tightens and wage growth increases. Investment growth is expected to weaken somewhat in 2018 as residential investment growth declines. We expect a slight easing in the pace of decline in insolvencies to 12% in 2018 reaching 51% of its 2007 level. In 2019 GDP growth is expected to moderate to 1.5% and the level of insolvencies is expected to stagnate. Germany’s economy is expected to gradually lose momentum over the coming two years as foreign demand weakens. Private consumption and investment growth are however, forecast to remain strong. Private consumption is bolstered by employment growth and strengthening wages. Investment growth remains robust. The insolvency forecast for 2018 is a decrease of 4%, followed by stagnation in 2019. GDP in France is forecast to expand 1.6% this year and remain at approximately this level next year. A reduction in social contributions and housing taxes along with wage increases and employment growth are likely to boost consumption. With unemployment decreasing and interest rates at low levels, we expect a 7% decline in the total number of insolvencies this year followed by a 5% decline in 2019. In Italy, a government was formed by the populist Lega and M5S (Five Star Movement). This successful formation of a government should bode well for stability, but the administration is expected to prioritize stricter migration policies and take a more vocal stance in the EU. GDP growth is expected to shift into a lower gear compared to 2017, but remains broad-based. Insolvencies are expected to decline 4% in 2018, a less pronounced decline than in 2017, bringing them to 187% of the 2007 level. In 2019 another 2% decline in insolvencies is forecast. Given the uncertainty about the fiscal agenda and reform, the insolvency forecast is subject to downward risk. Spain is entering its fifth year of growth, with unemployment falling and industrial production growing. These indicators are all expected to remain solid, although not all the damage from the 2011-2013 crisis has been repaired and there is a long road ahead before insolvencies are back at 2007 levels. We forecast a 3% decrease in insolvencies in 2018 as well as in 2019. The Portuguese economy is growing rather robustly and continued GDP growth is expected, as well as an improvement in unemployment. Industrial production growth is expected to decline in 2018 but should pick up again in 2019. Insolvencies in H1 of 2018 were down 20% from H2 of 2017, bringing our forecast for 2018 to a decline of 15%. In 2019 a decline of 5% is expected. Finland and Luxembourg are exceptions to the generally positive eurozone outlook. In Finland, higher employment, disposable income and solid consumer confidence are expected to drive household consumption. High capacity utilisation and favourable financing conditions should support investment. Despite the strong GDP growth outlook, insolvencies are up 25% in H1 of 2018 compared to H2 of 2017, bringing our forecast for 2018 to an increase of 12%. In 2019, a much smaller increase of 3% is expected. Luxembourg is facing a projected 17% increase in insolvencies in 2018 before improvement of 6% in 2019. In H1 of 2018, corporate failures increased more than 30% compared to H1 of 2017, largely concentrated in the retail sector as consumer preferences shift to online outlets. As the eurozone leads global improvements in the business environment again, other European markets are experiencing more difficulty. While economic growth across most of Western Europe remains strong, country-specific developments are causing business bankruptcies to tick up. 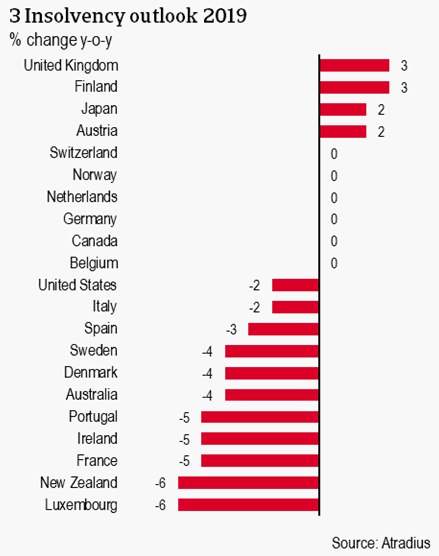 Denmark, Norway and, to a lesser extent, Sweden are following Finland in the trend of increasing insolvencies despite overall robust economic situations. Following disappointing H1 data, further challenges such as extreme weather conditions this summer could cause insolvencies to increase in the agricultural sector while also straining consumer spending due to the temporary increase in inflation. Tepid economic growth and mounting Brexit-related uncertainty are contributing to increasing bankruptcies in the United Kingdom. While the UK economy has demonstrated resilience through 2016 and 2017, economic growth is set to ease to 1.3% in 2018 and 1.4% in 2019. The loss of momentum comes as business investment declines related to Brexit uncertainty and sterling strengthens, reversing the boost to competitiveness of UK exports. The collapse of construction giant, Carillion, earlier this year has translated into higher construction sector bankruptcies. Higher inflation coupled with weak wage growth has also weighed on private consumption as personal bankruptcies have reached a six-year high and consumers shift to more online shopping. This has also driven increases in the retail sector. Higher interest rates and a tight fiscal stance are expected to continue straining economic activity in the UK. As such, we project insolvencies to increase 6% in 2018 followed by another 3% increase in 2019. The baseline scenario is that the official exit from the EU next year is followed immediately by a transition arrangement. In the case that this agreement does not work out, and a hard Brexit takes place, the number of corporate failures in the UK would likely increase further. After a 4% decline in 2017, momentum has continued to gather for US corporates, driving an upward revision of the 2018 outlook. Solid economic fundamentals have been stoked by tax reforms, driving up business confidence and driving down insolvencies. A strong expansion in GDP growth and decline in the number of insolvencies in H1 are driving a forecast 2.8% expansion in GDP and 8% decline in insolvencies. The current boom, however, is likely to be temporary. In 2019, US GDP growth is forecast to ease to 2.2% as the effect of fiscal stimulus fades. Downside risks are increasingly weighing on the US outlook and could have negative implications for the corporate sector. A strengthening US dollar and potential trade barriers, even the associated uncertainty, strain exporters. Domestically, changing shopping patterns, especially the shift away from mall shopping, is already causing major bankruptcies for retailers – a pattern which is expected to persist in the coming years. Rising interest rates are increasingly making financing more expensive and acting as another headwind for US corporates. As such, a sharp deceleration to -2% in bankruptcies is forecast for 2019.